My dad and I have just been informed that I have qualified for the East Regional Final for Wee Wonders. On Sunday we went to Ingrebourne Golf Club in Essex. It was an inland links golf course, well that’s what they said and it was brand new! So we had no idea what to expect. Below are the six regional qualifiers I’ve played at and regional finals I will play at. Hopefully, I qualify at one of these events to play at St Andrews (the home of golf). The last three weeks has been a wild journey that I’m happy to share with you guys. 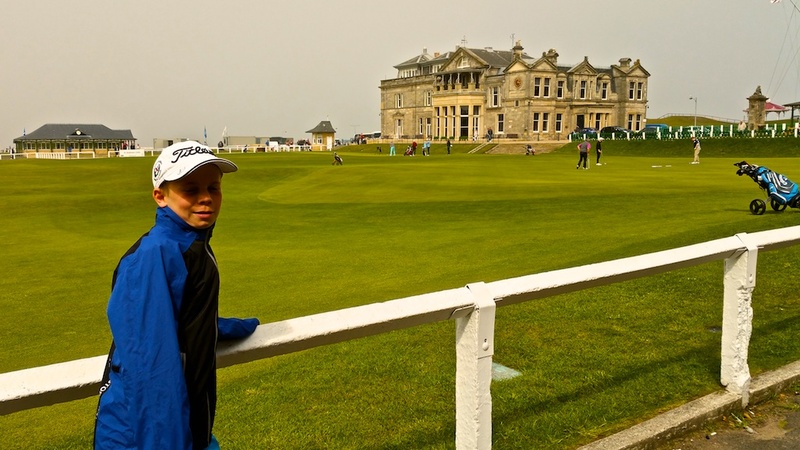 I’ve travelled thousands of miles playing loads of golf competitions including a number of Wee Wonders regional qualifiers and enjoyed every minute of fun. There have been a few times on course that have let me down, but the ups are much better than the downs ! Almost got a slam dunk hole in one too. In three weeks I have played the following courses, mostly chasing Wee Wonders regional qualifications. Wee Wonders qualifier back at Torphins where I qualified to play at Carnoustie ! A great 18 holes at Wells Golf Club where I shot 16 over. Finally today, a gentle nine holes in a par 3 Cappagh Cup competition at my home club. That’s a 153 holes of golf in 22 days ! And I got to go to Wentworth to see the BMW European Tour, popped over to Carnoustie to have a look and stopped to take a look at St Andrews ! View over the 1st and 18th fairways on The Old Course at St Andrews. In the background at the ‘Home of Golf’ is the Royal and Ancient Golf Club.